The Episcopal Diocese of Easton turns 150 this year. The diocese was carved out of the Diocese of Maryland as a free-standing diocese in November 1868. Christian presence and witness were introduced to the state of Maryland in 1631 with the founding of the first Anglican/Episcopal congregation, Christ Church, Kent Island. 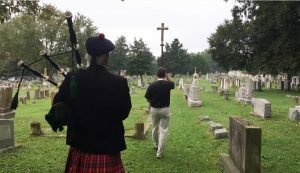 The processional, led by the cross and the piper, arrives at Springhill cemetery. As part of the diocese’s yearlong anniversary observances, the Bishop of Easton, the Right Reverend Dr. Santosh Marray, led a “Diocesan Founders’ Day” tribute on Tuesday, October 9, at the grave of Bishop Henry C. Lay, first bishop (1869-1888) and second bishop, William Forbes Adams (1869-1920), in Easton’s Springhill Cemetery and at Trinity Easton Cathedral, Goldsborough Street. Bishop Lay (1823-1885) began his episcopacy as the Episcopal Missionary Bishop for the Southwest in 1859, an area which encompassed Arkansas, Oklahoma, New Mexico and Arizona. In the Civil War he was one of the most famous bishops in the Confederacy, traveling throughout the South as the war progressed and coming face to face with the thousands of dead and wounded. He spent countless days in hospitals in Arkansas, Alabama, Virginia, South Carolina, and Georgia, visiting and pastoring the wounded and prisoners. He visited both Confederate and Union soldiers. In Virginia he visited Union prisoners of war; in Alabama, wounded Union soldiers. The processional arrives at the resting place of Bishop Lay. Bishop Lay had come to the meeting as a sign of reconciliation in the church, and because he was so well-known he agreed to send out an open letter to all churches and dioceses in the south. 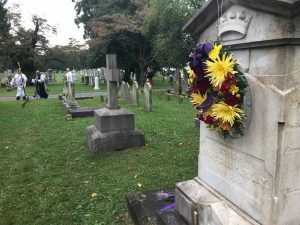 The words of Bishop Lay carried the greatest persuasion and within eight months every southern diocese had expressed its own reunion with the Episcopal Church. The actions of Bishop Lay kept the Episcopal Church intact, unlike other denominations, who divided. After being elected as the first Bishop of Easton in 1868, Lay set to work by treating the diocese as a missionary diocese, organizing it as he had done in Arkansas years ago, with the redemptive goal of bringing life back to the church on the Eastern Shore. Bishop Lay, in his earlier days before becoming Bishop of Easton, was known to own slaves. He later repented and became a fierce proponent of God’s mission to respect the dignity of every human being. He preached the gospel and reached out to the poor and to African Americans, extolling the diocese to increase mission outreach to them. Lay was concerned about orphans and began a diocesan orphanage which became the Children’s Home which lasted almost 90 years, from which today’s Children’s Home Foundation is its legacy. He was diligent about bringing the parishes together, and encouraging growth. At the end of his episcopacy, the number of communicants in the diocese had increased by 60%. 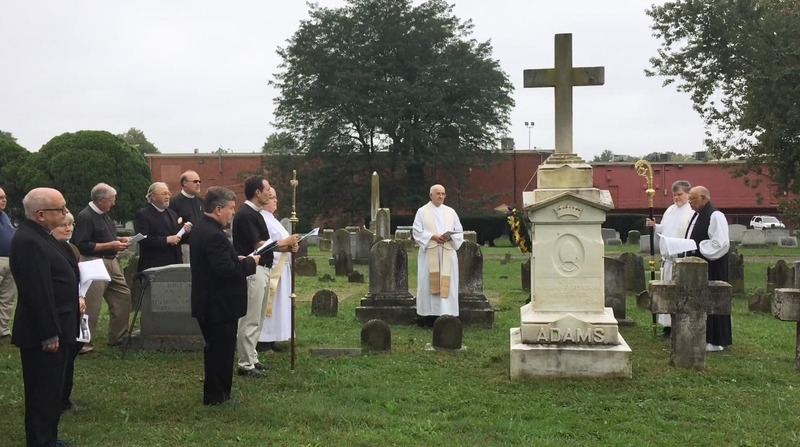 Members of the Diocese of Easton join with Bishop Santosh Marray (11th Bishop) at the gravesite of Bishop Adams (2nd Bishop). After giving a series of lectures in New York City in the fall of 1885, he fell ill and soon after died in Baltimore on September 17, 1885. On his deathbed friends remembered some of his last words being “I love everybody—yes, everybody.” Bishop Lay is being remembered as a champion of reconciliation and renewal in the nation and on the shore. The Diocese of Easton is also commemorating the selfless sacrifice of numerous bishops, clergy and lay people in promulgating and promoting the gospel of Jesus who labored in the churches across the eastern shore of Maryland. The Diocese of Easton comprises 39 congregations extending from Perryville in the north to Pocomoke City in the south to Ocean City in east and the Chesapeake Bay in the West, Camp Wright, Stevensville and Hillsboro Retreat House, Hillsboro.